The plan to extend Israeli sovereignty in Area C has three distinct advantages, described below, including that of achieving tranquility in the entire area. Most important, it is doable. The writer is the head of the Bayit Yehudi (Jewish Home) party and Minister of Economic and Religious Affairs since 2013.. He was formerly Chief of Staff of the office of Prime Minister Netanyahu and General Manager of the Council of Judea and Samaria. 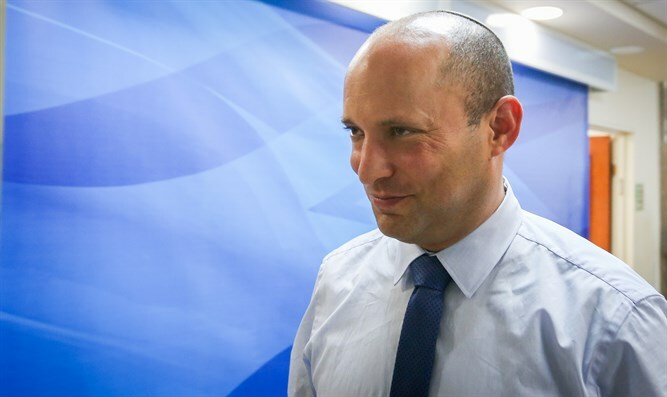 Editor's Note: Naftali Bennett was chosen by FoxNews to comment on Obama's speech to AIPAC, but he has recently been in the news in Israel for the plan below. This article was translated from the Hebrew newspapaer Makor Rishon. In the accompanying map, the light blue area is Area C, not heavily populated as the chart below shows and under full Israeli control by IDF civil administration, but not under Israeli legal and political sovereignty. The brown and tan areas are Areas A and B. During the two years I spend at the Council of Judea and Samaria, not a day passed without someone saying to me: Okay, we understand that a Palestinian state is a terrible idea. But what is your solution? What do you suggest? In the market of ideas today there are only two solutions for sale: The establishment of a Palestinian state on most of the area of Judea and Samaria, or total annexation of the area and its two million Arabs. By now, the public understands that the two solutions are untenable and that both endanger the future of the state of Israel for security reasons as well as demographic and ethical ones. The time has come to suggest a solution that is feasible, level-headed and that serves the interests of the state of Israel. The idea presented here, one that is now being formulated in detail, does not pretend to solve the entire gamut of problems once and forever, because there is no solution that can do that. This initiative, whose goals are modest, gives Israel three advantages: retaining the vital areas, strengthening international standing by neutralizing the ‘apartheid’ issue - and it creates stable conditions on the ground for the next several decades. And most important: it is achievable and doable. 1. Israeli will extend full sovereignty over Area C. by doing this, Israel will take the initiative and ensure its vital needs: security for the coast and Jerusalem, keeping the settlements intact and sovereignty over national heritage sites. The world will not recognize our sovereignty in the area, just as it does not recognize our sovereignty at the Western Wall, in the Ramot and Gilo neighborhoods of Jerusalem and in the Golan Heights. Not to worry, the world will get used to it. Area C forms a contiguous Israeli land mass and includes the Jordan Valley, the Dead Sea, Ben Gurion airport and surrounding area, Maaleh Adumim and all the Jewish communities in Judea and Samaria. Residents of Tel Aviv, the coastal plain, and the entire country will live in security and be protected from the threats from the east. 2. Full citizenship for the 50,000 Arabs who live in Area C. That is all the Arabs who are there, just 4% of the Arabs in Judea and Samaria. This will pull the rug out from under the Apartheid accusation. There are 350,000 Jews in Area C today and only 50,000 Arabs. Those Arabs can become full-fledged Israeli citizens. And they will all realize that no Arab or Jew will be expelled from his home there. 3. The PA will have full autonomy and contiguous public transportation in the areas under its control. Arabs there will be able to go from one place to another without roadblocks and soldiers. .Arabs hate long lines and traffic jams as much as Israelis do. This contiguous route is not easy to achieve but can be done for a one time investment of a few hundred million dollars. We can improve Arab lives and at the same time, remove the international humanitarian pressure on Israel. 4. No ‘refugee’ from Arab countries will be allowed to enter Judea and Samaria. This negates the PA state concept that allows for millions of ‘refugees’ and their descendants to flow into the area from Arab countries. It is unfortunate that Netanyahu, in his Bar Ilan speech, said that the “refugees” could return to the Palestinian State he envisaged. That is an egregious mistake that would lead to an irreversible demographic catastrophe. From the moment that millions of “refugees” from Lebanon, Syria, Egypt and other Arab countries flood Judea and Samaria, there is no turning back the clock, so we cannot allow that to occur. The descendants of the refugees must be absorbed by the nations wherein they reside, and in no case west of the Jordan River. 5. Israel will keep an IDF security “umbrella” open over all of Judea and Samaria. 6. Gaza will be separate from Judea and Samaria. The “secure passage” idea between Gaza and Yesha is passé. It would only lead to all of Gaza’s troubles stirring up violence in quiet Judea and Samaria. Gaza is joining Egypt little by little. It is already happening. We have no responsibility for Gaza. We expelled 8,000 Israelis from their Gush Katif homes there, we left every centimeter of land on which we had built communities there and in return, we got Hamastan. Let Egypt deal with it. 7. There will be massive economic investment to help Jews and Arabs live together in Area C: better infrastructure, highway interchanges, shared industrial areas. Peace begins with day to day living, with ordinary citizens. Instead of useless diplomatic cocktail parties in Oslo, Geneva and Camp David, there has to be an improvement on the ground, helping ordinary people. For example, an interchange at the Hizme checkpoint in Binyamin is long overdue. Every morning, thousands of Jews and Arabs sit out an unnecessary traffic jam together there. The roads also cause accidents because of their condition. I would transfer the money from the Geneva Proposal to the Department of Public Works and build this interchange. We must admit that there is no great love between Arabs and Jews in Judea and Samaria. But both sides realize by now that the other side is not going to evaporate Therefore, instead of wasting our time, money and blood on solutions that lead only to frustration and violence, we should concentrate on realistic plans that lead to stability and improved conditions. It is time for a fresh approach in which we give up - at present - on the maximum in order to obtain the optimium, the perfect for the good. It is also time for the state of Israel to take the initiative.